Paul Fisher is legally blind. He wears glasses so thick he looks like a bug-eyed alien, and kids tell a story about how he blinded himself by staring at an eclipse of the sun. But Paul doesn’t remember doing that. And he doesn’t mind the glasses, because with them he can see. Can see that his parents’ constant praise of his brother Erik, the football star, is to cover up something that is terribly wrong. But no one listens to Paul. Until his family moves to Tangerine. Tangerine is like another planet, where weird is normal. Lightning strikes at the same time every day. Underground fires burn for years. A sinkhole swallows a local school. 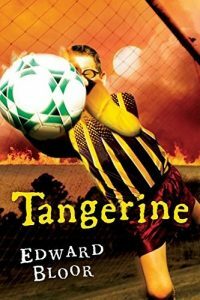 And Paul the geek finds himself adopted into the toughest group around–the soccer team of his middle school. Suddenly the blind can see, geeks can be cool, and–maybe–a twelve-year-old kid can finally face up to his terrifying older brother. In Tangerine, it seems, anything is possible. Order Tangerine by clicking here!